It's officially spring here in New York, although you would hardly guess it from the weather. Nevertheless, as early as it is in the season, I am already behind in my chores. One chore that could not be put off was moving the Blue Moon from her winter quarters in the town marina to her new mooring. 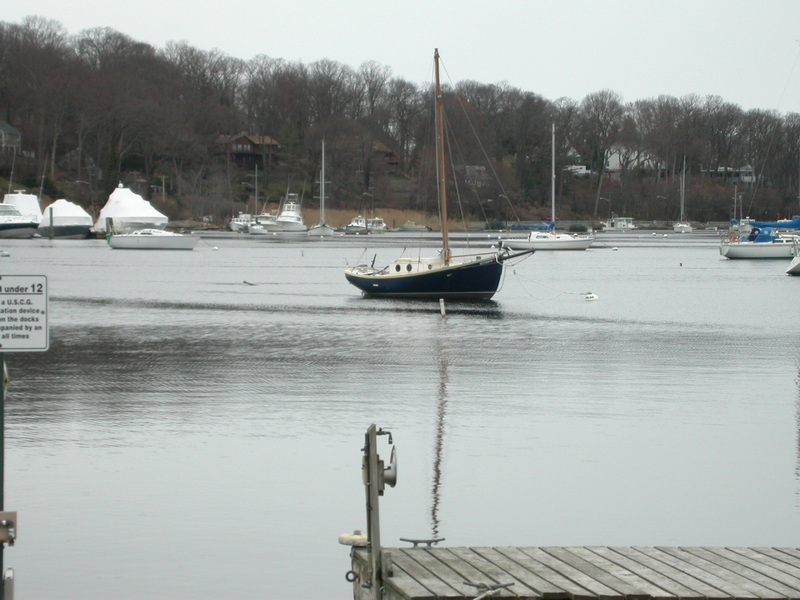 I'd been hoping for a mild winter, even fantasized about a New Years Day sail. Instead, we were treated to an exceptionally cold and snowy winter. More fun than digging out the driveway was digging out the Blue Moon. Add to to-do list: make full-length winter cover. I'd never kept a boat in water all winter long, so was a bit worried when Huntington Harbor froze up for the first time in years. The marina had a bubbler system, but when the mercury dipped well below freezing for a few weeks in a row, it could hardly keep up. For awhile, it looked like the Blue Moon was surrounded by ice and was sure to be crushed to bits. Until you poked the 'ice' with a boat hook and discovered it had the consistency of a very thick Slushy. The harbor was frozen solid, but the bubblers in the marina did their job. Since this was the worst winter in recorded history (most snow, ever, in January), I figure we've been through the worst that Nature can throw at us. And, yes, I know that is just the sort of hubris that Nature loves to prove wrong! I should just shut up about it. Anyway, faster than expected, it was time to move out of the winter slip and onto the summer mooring. I may be slightly biased, but I'm sure she's the prettiest boat in Huntington Harbor. You might be wondering where her boom, gaff, mizzen, & other spars are. In one word: varnish. More on that saga, later! In the meantime, Happy Spring! I send to you my Blue Moon/ Tayo-Mar Photo album. Thanks! I would love to hear how you set and strike your mizzen. Very difficult on heavy wind. I didn't change any details on the sailing plan.